David W. Hoyt, The old families of Salisbury and Amesbury Massachusetts : with some related families of Newbury, Haverhill, Ipswich, and Hampton, and of York County, Maine / David W. Hoyt., , at https://archive.org/stream/cu31924025963772 . Providence, R. I.: Snow & Farnham, (1897) , p. 658. Colby, Orren E (Clara M) agent Railway Express Agency, depot Concord, house 57 Centre. Colby, Orren E (Clara M) American Railway Express agent Franklin, house 54 No Main. living at 5 Rumford, Concord, Merrimack County, New Hampshire. Colby, Orren E (Clara M) agent Railway Express Agency, depot Concord, house 5 Rumford. Colby, Orren E (Clara M) agent Railway Express Agency, house 26 Dakin. Colby, Orren E (Clara M) retired. house 124 South. 1880 United States. Census Office. 10th census, 1880 federal population census, Washington, District of Columbia: National Archives and Records Service, ([19--]) , Census Place: Goffstown, Hillsborough, New Hampshire; Roll: 762; Family History Film: 1254762; Page: 287A; Enumeration District: 111; Image: 0576. "New Hampshire, Marriage Records, 1637-1947," index and images, FamilySearch (https://familysearch.org/pal:/MM9.1.1/FLC8-9FQ : accessed 24 Nov 2012), Orren E. Colby and Clara M. Houghton and null, 1921. 1930 United States. Bureau of the Census. 15th census, United States, 1930 federal census : population schedules ; NARA microfilm publication T626, Washington, District of Columbia: Bureau of the Census Micro-Film Laboratory, ([19--?]) , Census Place: Concord, Merrimack, New Hampshire; Roll: 1304; Page: 2A; Enumeration District: 16; Image: 692.0; FHL microfilm: 2341039. "New Hampshire, Deaths and Burials, 1784-1949," index, FamilySearch (https://familysearch.org/pal:/MM9.1.1/FD24-SQ9 : accessed 24 Nov 2012), Orren Elmus Colby, 08 Feb 1946; citing reference , FHL microfilm 2294749. New Hampshire Death Records, 1654-1947, at https://www.familysearch.org, FHL Film Number: 1001093. Colvin, Pearl N (widow Sidney O) house 1927 Tennyson St.
Social Security Death Index, at http://www.ancestry.com/ssdi/advanced.htm, Number: 514-70-5586;Issue State: Kansas;Issue Date: 1973. 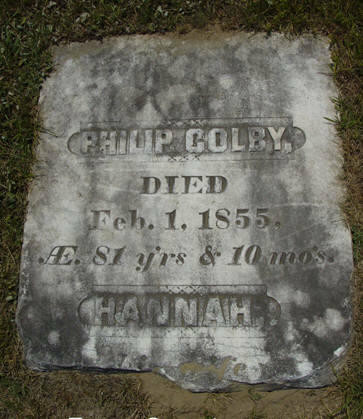 COLBY FAMILY & OTHERS at http://freepages.genealogy.rootsweb.com/~colby/colbyfam, citing FHL Number 1000976; Marriage: Hannah BAILEY, Date: 17 Aug 1797; Recorded in: Birth and Marriage Index for New Hampshire. COLBY FAMILY & OTHERS at http://freepages.genealogy.rootsweb.com/~colby/colbyfam, /d193.html. "New Hampshire Birth Records, Early to 1900," database with images, FamilySearch (https://familysearch.org/ark:/61903/1:1:FL2T-9J7 : 12 December 2014), Polly Andrew Colby, 01 Jan 1798; citing Bow, Merrimack, New Hampshire, United States, Bureau of Vital Records and Health Statistics, Concord; FHL microfilm 1,000,378. "New Hampshire Marriages, 1720-1920," database, FamilySearch (https://familysearch.org/ark:/61903/1:1:FDV4-933 : 31 December 2014), David Morgan and Polly Colby, 24 Dec 1815; citing reference ; FHL microfilm 986,096. Bow (New Hampshire). Town Clerk, Bow, New Hampshire town records, 1757-1977 and births, marriages, and deaths,1826-1915, Salt Lake City, Utah: Filmed by the Genealogical Society of Utah, (2001) , p. 332. Harrison Colby, A genealogy of the descendants of Abraham Colby and Elizabeth Blaisdell, his wife, who settled in Bow in 1768, , at https://archive.org/details/genealogyofdesce00colb . Concord, N.H.: Printed by the Republican Press Association, (1895) Microfilm #896944 of the Family History Library, Salt Lake City, Utah, p. 79. New Hampshire Births and Christenings, 1714-1904, at https://beta.familysearch.org/s/collection/show#uri=http%3A%2F%2Fpilot.familysearch.org%2Frecords%2Ftrk%3A%2Ffsrs%2Fc1680836&hash=HloWXpZgU9zB10k5M56iYku8TUc%253D, Indexing Project (Batch) Number C50265-1. 1850 United States. Census Office. 7th census, Population schedules of the seventh census of the United States, 1850, Washington, District of Columbia: National Archives. Central Plains Region, (1964) , Census Place: Bow, Merrimack, New Hampshire; Roll: M432_435; Page: 171B; Image: 351.
living at Burlington, Chittenden County, Vermont. living at Saint Armand, Essex County, New York. "New York State Census, 1855," database with images, FamilySearch (https://familysearch.org/ark:/61903/1:1:K6Q6-S2N : accessed 11 November 2015), Porter W Colby, E.D. 1-2, St. Armand, Essex, New York, United States; count clerk offices, New York; FHL microfilm 866,320. Maurice J Pollard, The history of the Pollard family of America, Vol. 2, , at https://babel.hathitrust.org/cgi/pt?id=wu.89066125477 . Dover, N.H.: (1964) , pp. 144-5. 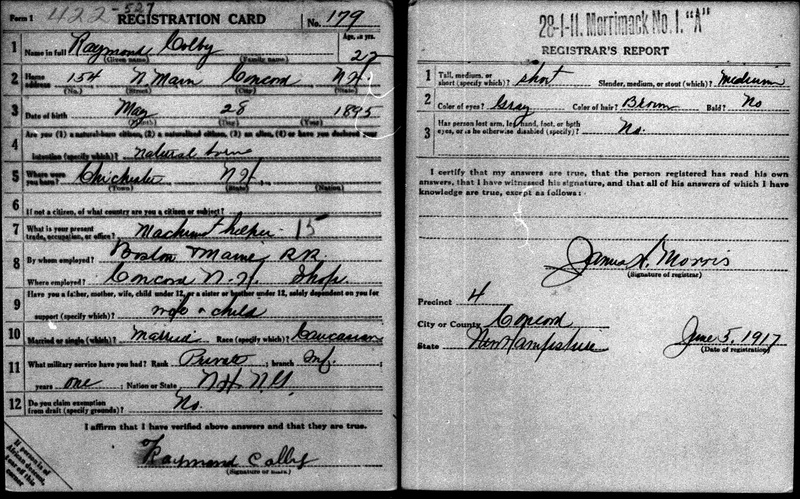 "New Hampshire, Marriage Records, 1637-1947," index and images, FamilySearch (https://familysearch.org/pal:/MM9.1.1/FLCZ-Y7W : accessed 24 Nov 2012), Arthur R. Colby and Frances Rita Turcotte and null, 1924. 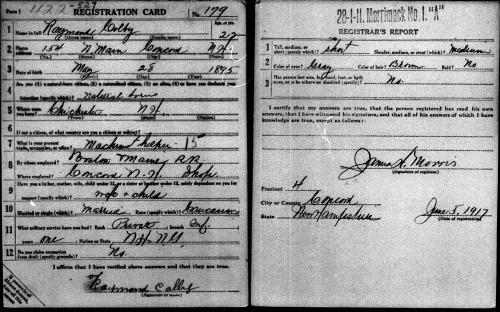 "United States World War I Draft Registration Cards, 1917-1918," database with images, FamilySearch (https://familysearch.org/ark:/61903/1:1:KZJ7-SXF : accessed 6 April 2016), Raymond Colby, 1917-1918; citing Merrimack County no 1, New Hampshire, United States, NARA microfilm publication M1509 (Washington D.C.: National Archives and Records Administration, n.d.); FHL microfilm 1,711,725. 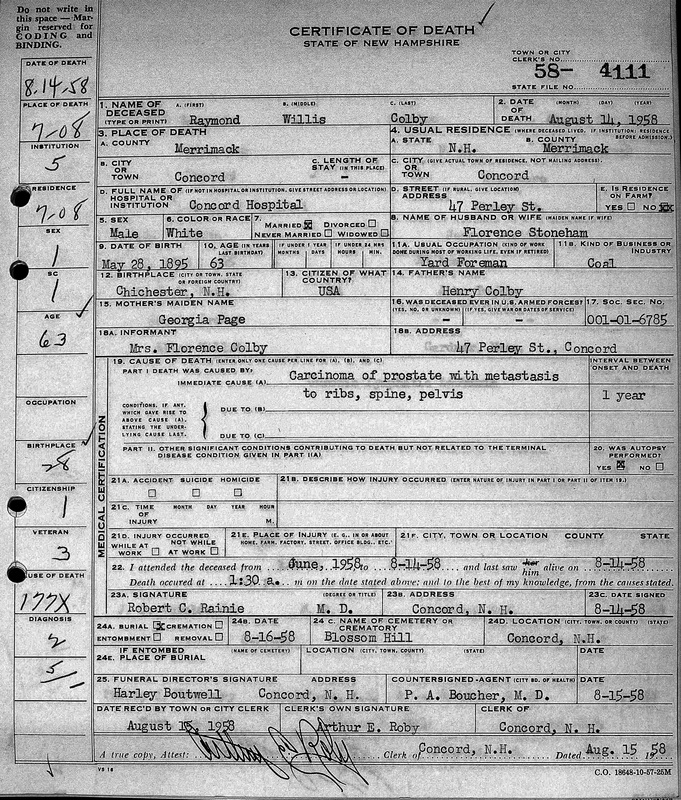 "United States World War II Draft Registration Cards, 1942," database with images, FamilySearch (https://familysearch.org/ark:/61903/1:1:VKJJ-81L : accessed 6 April 2016), Raymond Willis Colby, 1942; citing NARA microfilm publication M1936, M1937, M1939, M1951, M1962, M1964, M1986, M2090, and M2097 (Washington D.C.: National Archives and Records Administration, n.d.). "New Hampshire Marriage Records, 1637-1947," database with images, FamilySearch (https://familysearch.org/ark:/61903/1:1:FLC8-MBZ : accessed 6 April 2016), Raymond Willis Colby and Florence Helena Rose Stoneham, 28 Nov 1914; citing Concord, , New Hampshire, Bureau of Vital Records and Health Statistics, Concord; FHL microfilm 2,057,689. "New Hampshire Marriage Records, 1637-1947," database with images, FamilySearch (https://familysearch.org/ark:/61903/1:1:FLX3-S96 : accessed 6 April 2016), Edward Eugene Cox and Bertha May Colby, 04 Apr 1940; citing Concord, Merrimack, New Hampshire, Bureau of Vital Records and Health Statistics, Concord; FHL microfilm 2,319,640. 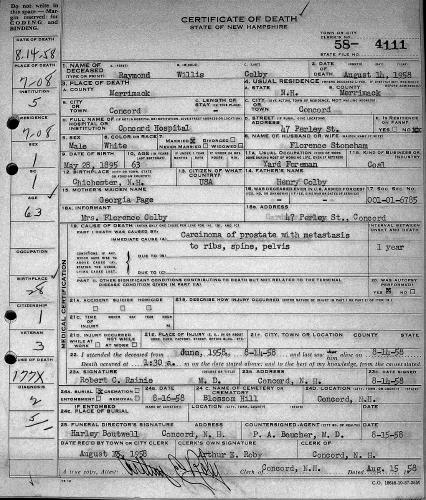 "United States Census, 1940," database with images, FamilySearch (https://familysearch.org/ark:/61903/1:1:VT9W-NN3 : accessed 12 November 2016), Leon E Colby in household of Raymond W Colby, Ward 6, Concord, Concord City, Merrimack, New Hampshire, United States; citing enumeration district (ED) 7-25, sheet 5A, line 36, family 88, Sixteenth Census of the United States, 1940, NARA digital publication T627. Records of the Bureau of the Census, 1790 - 2007, RG 29. Washington, D.C.: National Archives and Records Administration, 2012, roll 2293. Reuben died on May 30, 1852 in Bow, Merrimack County, New Hampshire, at age 56. He was buried in Evans (North) Cemetery on White Rock Hill Rd, by Turee Pond, Bow, Merrimack County, New Hampshire. COLBY FAMILY & OTHERS at http://freepages.genealogy.rootsweb.com/~colby/colbyfam, /d196.html.